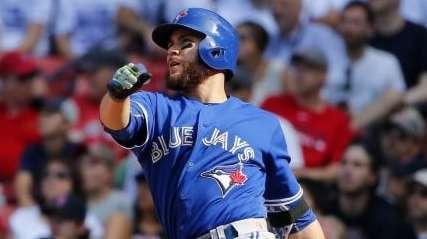 BOSTON -- Russell Martin delivered the go-ahead hit for the second straight day, a leadoff home run in the 11th inning Saturday that sent the Toronto Blue Jays to their 10th straight win, 5-4, over the Boston Red Sox. The winning streak is Toronto's longest since it took 11 in a row in June 2013. Boston, in last place in the AL East, lost its fifth straight game and fell a season-worst nine games under .500 at 27-36. On Friday night, Martin hit a tiebreaking, bases-loaded triple during a nine-run burst in the seventh for a 13-10 victory. Saturday, he drove a 2-and-0 pitch from Matt Barnes (2-2) deep into the left-centerfield stands for his 10th homer of the season. Brett Cecil pitched a perfect 11th for his fourth save, and second in two days, to preserve the win for Aaron Loup (2-3). Toronto took a 3-0 lead in the second when it loaded the bases on singles by its first three batters -- Edwin Encarnacion, Chris Colabello and Martin. Any possibility of a repeat of Friday night's nine-run inning, when the first nine hitters scored before a batter was out, ended when Justin Smoak struck out.